Let me tell you something that isn't exactly news: I've been in this game a long time. I was pushing Extras and hollering 'read all about it' around Hob's Bay when Buckwheat and Alfalfa were the main draws to the old Fleischer Theatre. My first big story for the Planet was covering the 50th anniversary of the Fleischer. My last story, before I made the bonehead move of joining editorial was covering the shutting down of the old girl. I've been around, and I've seen a lot of things in this business. If there's one thing I've learned it's this: a great reporter has two virtues. One, integrity. Being honest to your story is prime directive number one, but this bleeds over into your work as a whole. You're good to your story, you're good to your fellow reporters. Two, gusto. If a reporter can't muster the vigor needed to not only get a good story but do what's necessary to get it, then he or she won't be tapping away at a keyboard for very long. It's perfect when a reporter has integrity and gusto nicely balanced, but that's a rarity. Take for example my two aces. One has integrity from here to Keystone City; the other could fill Wayne Tower with her gusto. If I could get STAR Labs to squash these two together somehow, I'd have created the perfect reporter. Just today, which started out as a slow day on news, these two were lumbering around our offices, one enjoying the idea of taking it easy, the other burning a hole in the floor from pacing. When a story came in to cover the Metropolis Bow Wow Cup Dog Show, these two cursed aces had to bet on who would write the better story. Off they went. By the end of the day, the one with integrity had written a superb piece about the dog show. Only a grade A newshound could know so many synonyms for 'furry'. The other, the one with all the piss and vinegar, wrote a piece about Superman's more-than-usual exploits that day. That story adorns the front page of this evening edition you're now reading. So, we have our honest-as-pie farm boy making sure he keeps his word and follows through with the bet, and our sharp-as-a-$500-suit military brat making sure she delivers the top story. My ace reporters, both. If I could only get them to work together better. Maybe I'll call STAR Labs in the morning. Story - 3: This was a decent little story, with very good intentions. I liked seeing the rivalry between Clark and Lois, and I liked that Lois took advantage and got the big story, while Clark saved the day multiple times, and still kept his word on the bet. 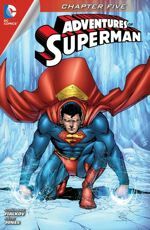 What I really didn't like was the matter-of-fact manner in which Superman goes about saving the day. Taking out Luthor, Toyman, Ultra Humanite, a meteor, a fire, among other things, and traveling through time in a single day diminishes the significance of those villains. It was a bit much, I think, and doesn't quite honor the brilliant rogues gallery in the mythos. What's more, I wasn't too keen on all of the huffing and sighing coming from Superman. It seemed like a chore for him to save people, doing it out of some sort of unavoidable duty rather than genuine commiseration for those in danger. It didn't feel right, and crippled the story immensely. Art - 4: I decided to give the art a generous score. 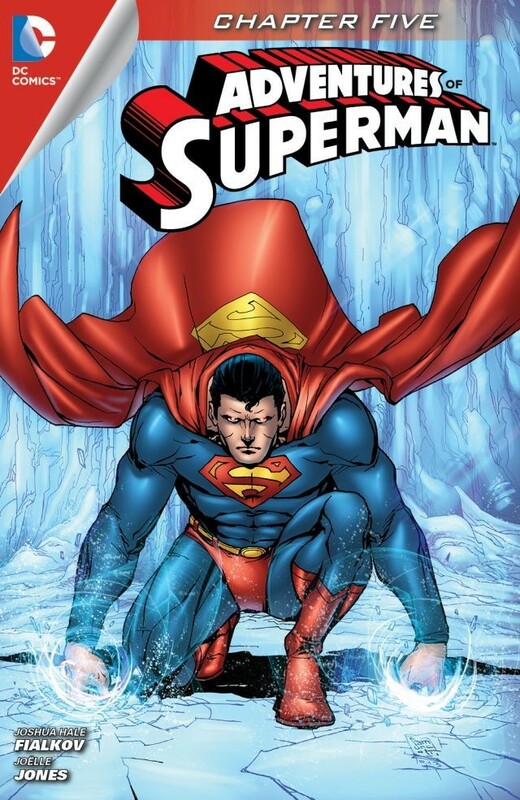 It's not that it doesn't deserve a 4 out of 5 in its entirety, but I don't care for how Jones draws Superman. In the end, I chose not to minus a point because I love everything else Jones did here. The 50's era tone blended with modernity is pure eye candy. Filardi's colors accentuate the whole package, making the issue, for the most part, beautiful to look at.